Soil acidity can be measured using a special pH meter or soil testing kit. 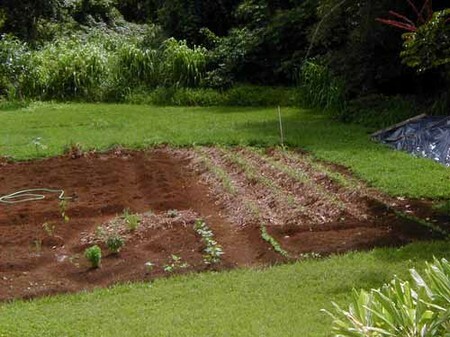 The end result of either is a numerical assess­ment of the soil. A figure above 7 will indicate an alkaline soil — in some areas, chalk may be evident. Below 7 indicates a more acid soil and, of course, the degrees of alkalinity or acidity are indi­cated by how high or low the numbers are recorded. Rhododendrons, azaleas, camellias, pieris, kalmias, certain heathers and several other plants require an acid soil if they are to succeed, i.e. below 7. It is, therefore, important to check that any plant you are thinking of using will tolerate the local soil conditions. Wet soil may prove hostile to alpine plants, some bulbs, border carnations, strawberries and several low-growing hairy plants. If any area of the garden is persistently wet, ‘bog’ plants should be used, such as hostas, astilbes, Lobelia cardinalis, coloured stemmed dogwoods (Cornus), willows (Salix) etc. Cold winds: plants which are reputed to be unreliably hardy in your district may survive radiation frost on still nights but will often succumb to cold or freezing winds. A south-facing wall is probably the only location where such plants would survive under these conditions. Salt-laden winds: gardens close to the sea will often experience salty air and this damages a good number of plants. The degree of damage does, however, vary considerably from one garden to another which makes some experimentation worthwhile. A list of some salt-tolerant plants is given later. Sun and shade: this is perhaps one of the most important yet contentious aspects of plant selection. Every plant has its own special requirements when it comes to light. If it is not receiving the ideal level of light its leaves, flowers, fruits and even its growth will be something less than perfect. A designer will have chosen a particular plant for a specific reason: leaf colour, flowers, shape, size etc. It is, therefore, important that the light levels in that particular part of the garden do not excessively impair those very qualities for which the plant has been chosen. If, for example, a flowering plant has actu­ally been used for its foliage rather than for its flowers, it probably does not matter if the light is such that it produces accept­able foliage but hardly any flowers. If, on the other hand, a plant has been selected for its profuse flowering, there is little point in planting it somewhere where the light levels prevent it from doing just this. In most cases, the best policy is to have an awareness of the ideal and temper this with varying degrees of tolerance. Shade from overhanging trees: reduced light is one thing but dry soil beneath a tree is an added problem which will limit the choice of plants. Many plants which perform reasonably well in straightfor­ward shade may fail completely under a large, mature tree. A separate list of successful plants is given later but even these should not be left unattended after planting. They will need regular watering during their first growing season so that roots can develop and penetrate to a depth where they can draw moisture, even during very dry periods.